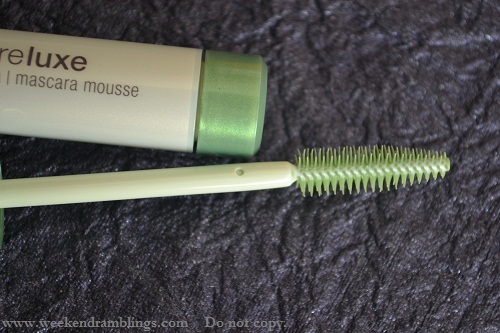 It was the pretty green packaging that first got my attention and the mascara wand that looked quite promising with its neat row of bristles. 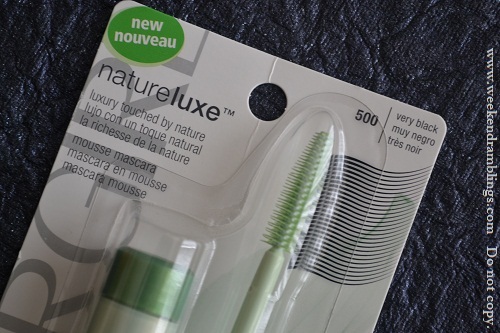 The formula claimed to be light weight and easy to wash off, and I needed a new mascara, so this came home with me. Very black - is the shade I picked up. 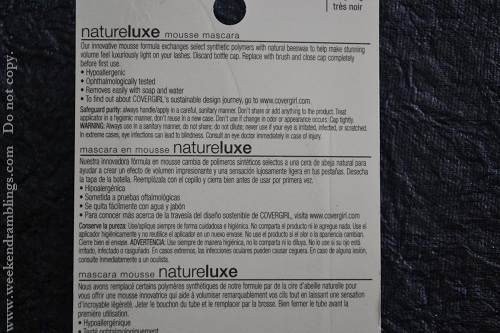 This mousse mascara comes packaged slightly differently from the usual mascara tubes. The wand is packed separately and not inside the bottle. You have to remove/discard the cap and then replace it with the wand-cap. I guess the purpose is so that the wand can be seen properly, and as a marketing strategy, it sure worked for me :D On to the wand itself, this is my favorite kind, with stiff bristles that help get even coats and definition without the clumps. Actual Performance: This is a very light weight mascara, and the wand picks up just the required quantity of mascara without the goopy mess. On my eyes, one coat made hardly any difference. I needed two coats to get it to show some effect, but I didn't have any clumping even at this stage. It washes off easily enough with soap and water, and since I hardly ever purchase waterproof eye makeup, this is a good thing for me. 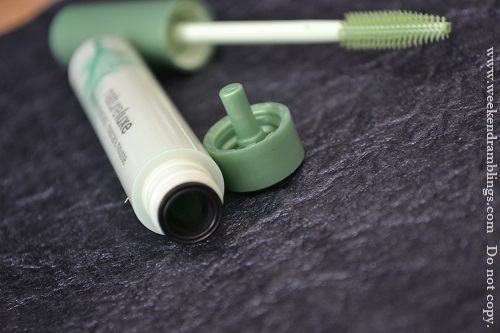 Waterproof version of the same mascara is also available for those who prefer that. Overall, I think this mascara is best suited for those with thick/long lashes who just need a light coverage and that's all. It does not give much of a curl or volume but does make my lashes look longer. 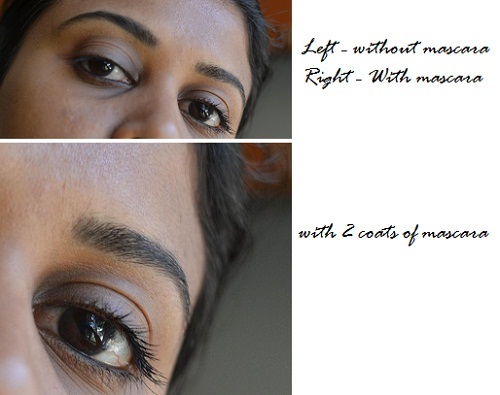 For me personally, I do not like clumping and want a natural-looking effect - so this is a good enough mascara. My favorite part would definitely be the wand - gives an awesome clump-free application with the least effort. You might want to look elsewhere, though, if you want a more dramatic effect in terms of volume and like the mascara to deliver with just one coat - you would find this mascara a little too lightweight. i figured that it wouldn't be dramatic, just everyday...my wimpy lashes wouldn't like it, lol. i need VAVAVOOM! covergirl packs all its mascaras in this way- I really like that... I think I'll pass this though! Ya..I noticed that - is quite different from the usual ones I have seen :) Which mascara do you like among the drugstore brands? This just might be what I've been looking for. I (thankfully) have good lashes and getting the really volumizing or lengthening mascaras makes me look overdone really fast. I just want some definition and brightening of the lashes. WHat a lovely mascara......I found its dupe from their own sister brand Max Factor in India called Xperience...they have the same content and what a fantastic mascara. Ur lashes look so amazing. Gr8 product. such pretty packaging - i'd buy it for that! Hi Neeraj..Max Factor does make some great products - I have tried one of their mascaras - forgot the name - but that had a similar wand but a little bigger and it was quite good too. Taps - Never tried the Lotus mascaras..are they good? 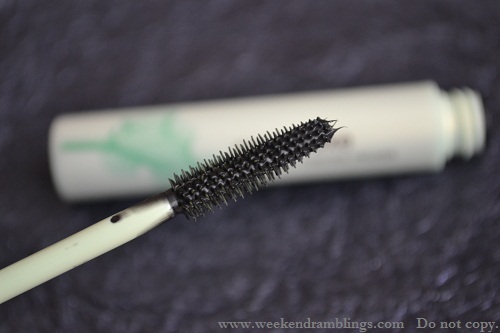 Shweta - Ohh..this might be too light for you then..
Rads I have reviewed lotus herbals botanical mascara on IMBB , you can check that out, effect is really great but its not waterproof !though waterproof is mentioned in the cover! 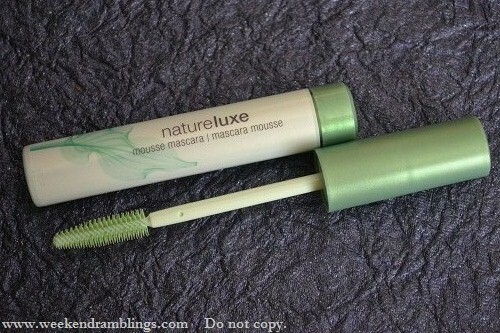 would you be able to tell me if the nature luxe mousse mascara is water-based or oil-based? It has beeswax in it, so oil-based? Am not too sure, but you could check the ingredients list photo to get a better idea. 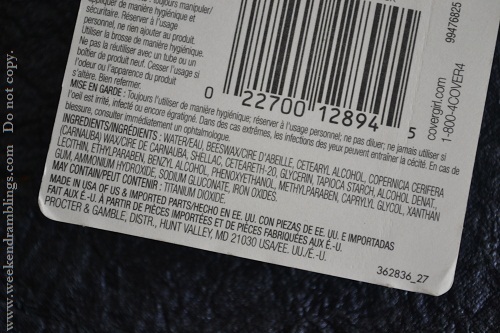 I have the water-removable version..not the waterproof version, so there might be some differences in the ingredients.